Look-before we get to waffles. Can we just talk about my neuroses right now? I feel like there are these events in your life that you look forward to and that are built up to be a thing--namely 16th birthday, prom, and your wedding. For me--those were the 3 ultimate events. And on the previous 2 I ended up with nothing but a mess of disappointment. Not only did I not get a super cool 16th birthday party with like a d.j. or whatever (I had big hopes and dreams)...I got no birthday party at all. The friend who I entrusted with it (and who INSISTED she be the one to throw it)--ended up being "too busy" and flaked on it. Which I found out about when it was like...my birthday. (My best friend is still pissed that I didn't just let her throw it. SORRY ALEX!) And then prom..I mean I went to like 4 proms and all were kind of ok. Definitely not magical. And my senior prom in particular-my dress was blah and I went with my gay friend and ended up crying the whole time because I was still heartbroken about the guy I'd been dating and who I'd gone to prom with the previous year, thusly resulting in me getting hit with memories everywhere I looked. Not exactly a great night. So...now it's all on the wedding. And I'm terrified. I know it won't be perfect but--I mean...I'd love for it to still be GOOD...like maybe even great...ya know? But I'm so scared something will happen (family drama, Michael being cranky, me getting my period--sorry TMI--...etc.) I've legitimately been having nightmares about being disappointed by my wedding for like...ever. At least as long as Michael and I have been together (so 5+ years). The good news is: most of my dream fears have already been 100% made impossible. But still. Ya know. Worries and such. Do any of you guys know what I mean? And if you've had a wedding--any advice? Enough about me being a crazy person. Let's discuss waffles, shall we? These were the 1st waffles I got to make in my brand new waffle maker that I got from one of my bridal showers. And ohhh they turned out beautifully! These waffles are thick and crisp on the outside while being delightfully chewy on the inside. There are decadent chunks of chocolate that you get the delightful surprise of biting into. They're simple to whip up (no beating egg whites or anything fancy like that) Annd...oh yeah...they are fairly healthyish (thanks to whole wheat, decreased sugar, etc.)! 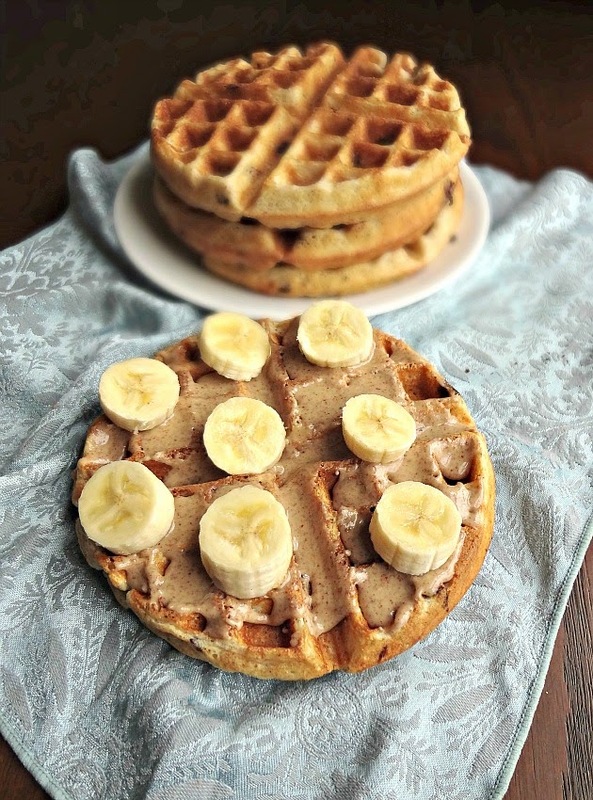 And for an extra tasty and nutritious breakfast or snack---I topped these waffles with almond butter and banana slices. HEAVEN! I also broke leftovers into quarters, froze them, and then toasted them as needed. 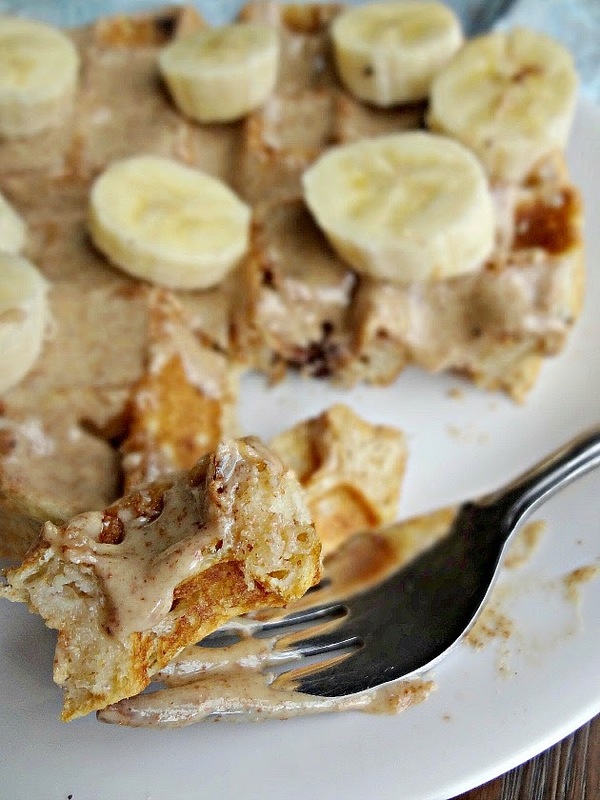 Which results in the best toaster waffles ever--and much healthier ones! In a large bowl whisk together the flours, baking powder, baking soda, salt, and sugar. In a medium bowl whisk together the butter, eggs, vanilla, and buttermilk. Stir the wet ingredients into the dry ingredients until just combined. 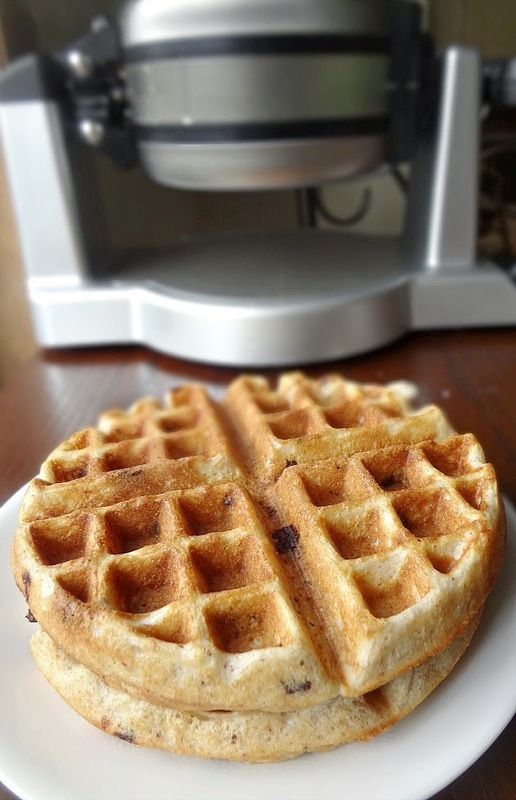 Stir in the chocolate.-Do not overmix the batter, lumps are ok.
Cook waffles according to waffle maker instructions. 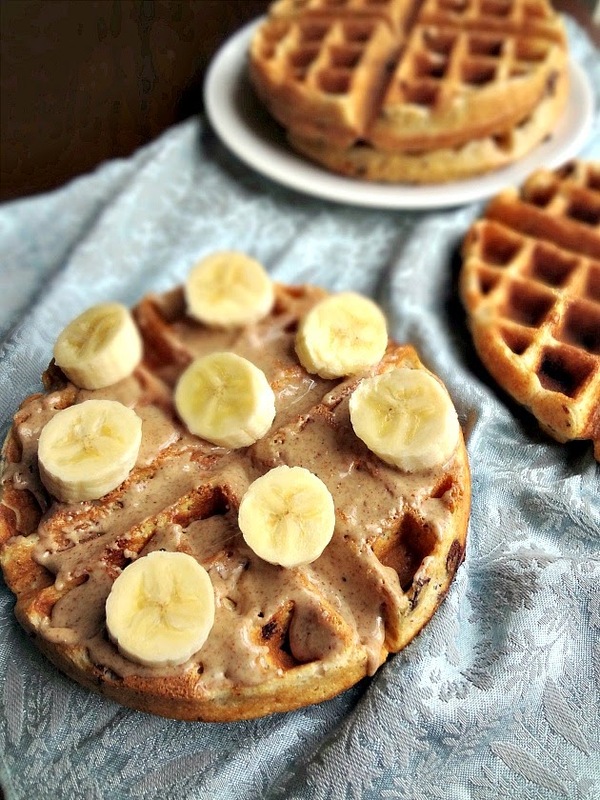 Serve warm topped with almond butter and bananas. For leftovers-let waffles cool completely. Place in freezer bags and store in the freezer until ready to eat--then toast or heat in a 350F degree oven until heated through. Mmmm I think I should whip up another batch!